My lighting set-up for a rain shot is simple: the key backlight and an optional fill front light. The devil, however, is in the detail. My backlight is usually placed at least 3-5 meters / 9-15 feet behind the couple. Getting a feel for this distance is probably the most important element in the entire lighting set-up. 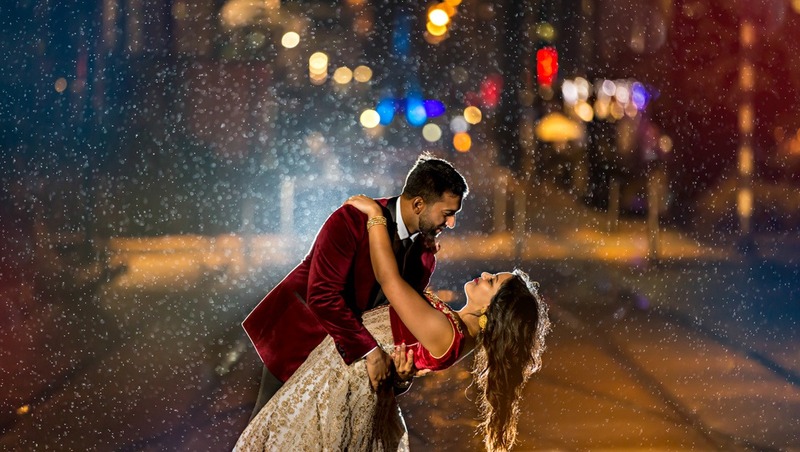 If the backlight is too close to the couple, it won’t light-up enough rain droplets for the shot to get that dramatic look. On the other hand, if the light is too far, it doesn't provide enough contrast to outline the couple and separate them from the background. Moreover, if I’m going for a "wet everywhere" look, I like some droplets of rain to show-up in front of the couple i.e. between the couple and the camera. For this particular effect, it is important that the light is not too far behind the couple. For the height of the backlight, I usually go for an approximate chest height of the couple so that the strobes are not seen by the camera. The shot itself is composed from a slightly lower angle to ensure that the strobes are not seen. Often, when it rains during a couple’s portrait session, the conditions are less than ideal. I may not be in a massive open space with symmetrical features in the background. I may have a lot of distracting buildings or trees behind the couple. It may not be completely dark, either due to the time of day or due to our location being in the middle of an urban setting. The way I tackle any or a combination of the above factors is by using a fair amount of power in my backlight to "defeat" the background and make the rain droplets standout. The way I do this is by either attaching 3-4 flashes to a single stand with a quad bracket or by using a single portable strobe that can give me 500Ws easily. Depending on the situation and resources on hand, I might opt for a fill light in front of the couple to bring more focus to their faces or the bride’s dress. This is usually a single flash with a softbox umbrella on a monopod handled by a lighting assistant held high and close to the couple. 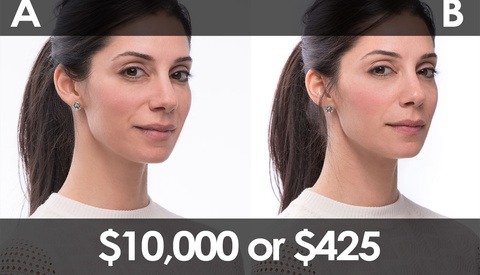 This set-up for the fill-light produces an evenly spread soft light on the main subjects. Sometimes, I like to play with the idea of rain being cold. 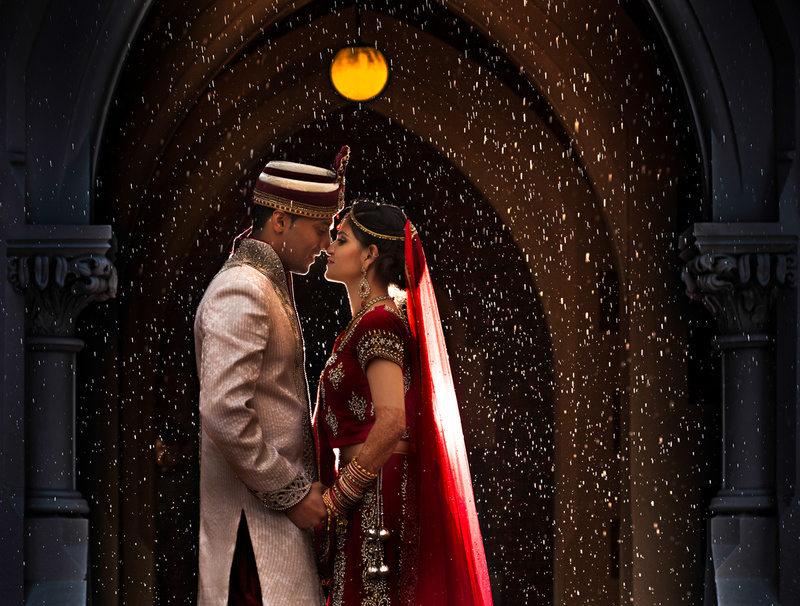 To assist with this effect, I use CTB gels on the backlight flashes to give a blue tinge to the rain behind the couple. For a more dramatic look, I might choose to gel the front fill flash with a CTO gel. This gives me options including shifting the color temperature in Lightroom to produce a more emphatic blue in the background. 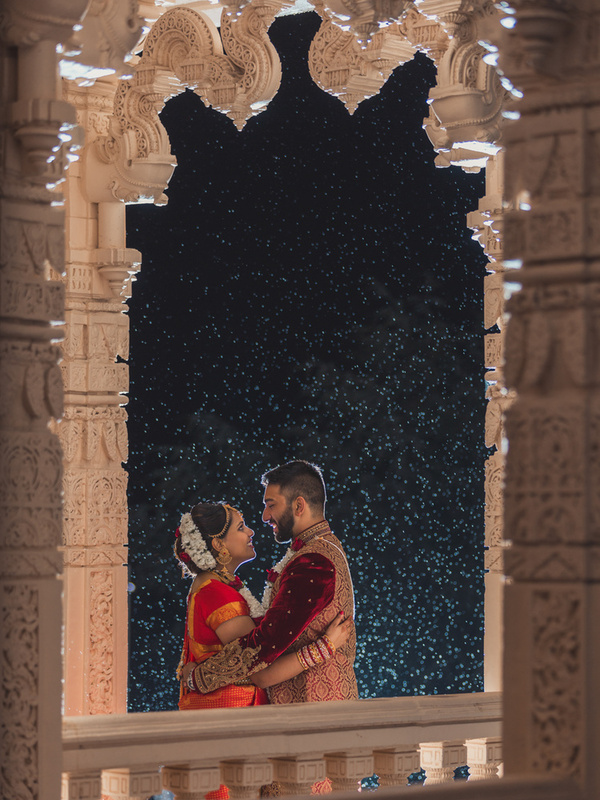 Having seen all the beautiful rain shots I'd been merrily creating, my fiancé at the time and now my wife, Divya, asked me if we could have a rain shot for our engagement photos. I spoke to my colleague who was supposed to shoot our session and he agreed. This is me and my wife (then fiancé), freezing ourselves in our backyard to create the rain-but-not-rain shot with a garden hose. Photo by Vineet Menon for One By Infinity. It was winter in Auckland and that means rain is pretty much guaranteed. But on the day of the shoot, there wasn't a single cloud in the sky. For the uninitiated, no cloud usually means no rain. And no rain means no rain shot. Except, we decided to give the good ol' garden hose a try. So we went to our backyard and created our own rain-but-not-rain shot. And froze ourselves silly in the process. Have you ever shot a rain portrait? Share the results in the comments section below. I like these kinds of shots except when the light source is too obvious (all but the third example). You could argue, showing the source explains the lit rain but you would be hard pressed to explain the light source being in that location. Simply outstanding seriously no words just brilliant all of the 4 pictures it looked amazing and great work and my favorite is 1st one because it looks real I am also a beginner in photoshop and learning this tool and currently doing https://www.assignmenttutor.co.uk/ and making some basics logos for my project. 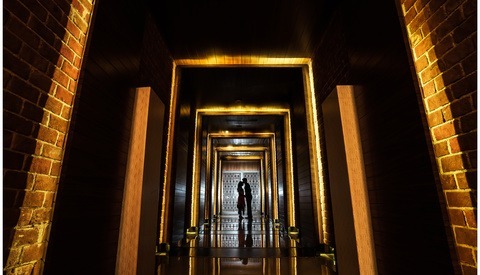 It's miles vital that the light is not too a long way behind the couple. For the peak of the backlight, I generally cross for an approximate chest top of the couple so that the strobes aren't visible by way of the digicam. 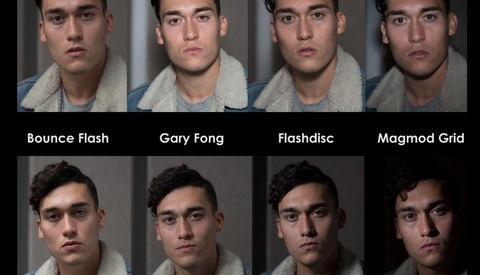 The shot itself consists of a barely decrease attitude to make sure that the strobes are not visible https://thedissertationhelp.co.uk/write-my-dissertation/. Very impressive photos, I appreciate your hard work. You prove that an individual can make their career where they have interest and now we are living in an era where the internet has become an essential thing for us which also give us a chance to improve our career because it allows us to access many career-building websites https://mycareersaver.com/ which will help us to move towards our career goal. So, this is the blessing of technology which makes our life easier than before.